We are the home of Mat Time and take it very serious. Wrestlers coming together under one roof to focus on developing technical skills, athlete training, and life skills. Our goal is to offer a state of the art facility giving wrestlers the opportunity to practice 7 days a week by themselves, with friends, or a coach. Our facility will offer various beginners classes for all ages and special clinics for more advance wrestlers. The lessons we teach have an immediate and long-term impact on the athletes that translates to success on the mat, in the classroom, and in life. The work ethic and discipline instilled at our programs becomes a part of their core, creating tough, determined athletes who channel their skills towards achievement in all aspects of life. In addition to our specialized wrestling programs we offer numerous personal training programs for anyone looking to increase their strength, endurance, flexibility and overall well-being. Kombat Wrestling is the home of MAT TIME. Our facility is built by wrestlers for wrestlers. We recognize the need for a place for wrestlers to practice and train in addition to their school or organization. KFIT offers flexible packages for all ages. Our Den is accessible 7 days a week through our scheduling portal. Bookings are scheduled in one hour increments and you are able to see how many wrestlers are attending each session. Click button below for current Mat Time packages. The wrestling Den is also available to reserve by local organizations or schools for their own training or special events. Please call or email info@tkwrestling.com for more details. Is your child interested in wrestling? This class is specifically designed as a practice for new wrestlers of all ages. They will learn the basics of neutral, top and bottom positions. Our staff will teach them a few basic moves for each position including finishing to the PIN. It's also a great way to gain endurance, strength, and flexibility. Please call or email info@tkwrestling.com for more info. Do you dislike crowds, have pre-existing medical conditions, want to workout on your own schedule, or take your workout to the next level? It needs to be all about you! That’s what our Personal Training program is all about! The exact training regimen is based on your goals and current physical conditioning. Your personal trainer will be there to personally guide your physical fitness development! This is our KFIT PT with a strong focus on agility, athletic competition, explosive movements, and plyometrics. AT also gives the trainer access to our Reaxing Zone. The Reaxing Zone is completely outfitted with Trx cables, kettlebells, Unpredictable turf, Unpredictable interference, Adjustable impulse, Adjustable speed, reaxlights and so much more. Are you KOMBAT Ready? Our goal at KOMBAT FITNESS (KFIT) is to provide a friendly family atmosphere where everyone helps push one another to reach his or her desired goals! We are really here for each other! Our bootcamp classes offer a variety of high intensity methods designed by marine corps veterans with over 22 years experience in the fitness industry. BootCamp is functional fitness-based, dynamic, fast paced, and no workout is exactly the same keeping you and your body guessing. Every workout is designed to get your full body in Kombat Ready condition. We address every area of fitness, including cardiac respiratory, muscular strength, muscular endurance, and flexibility! OH did we say its HIGH Intensity!! 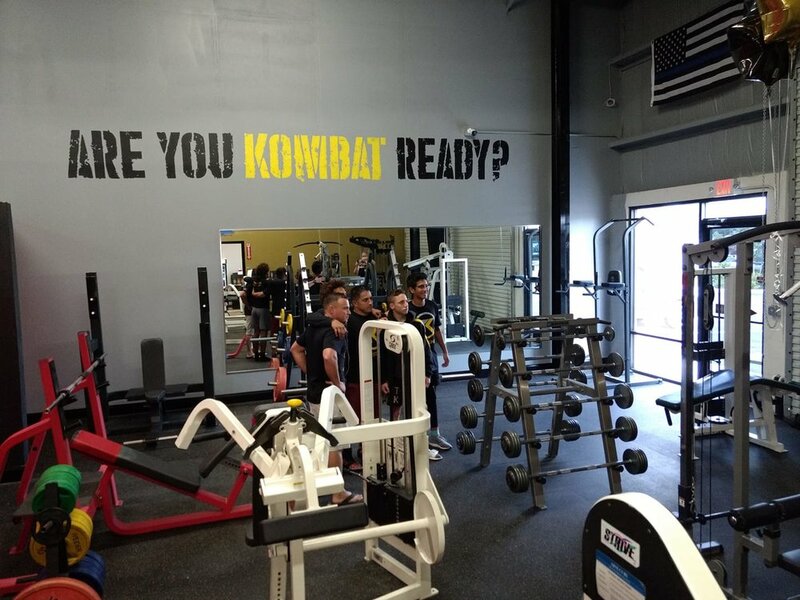 Kombat High Intensity Training is exactly what is sounds like - An extreme high intensity class using Kombat moves along with plyometrics, cardiovascular, and compound weightlifting movements. You will be pushed beyond your limits, you will get uncomfortable, you will sweat ALOT, and you will continue to shred that fat even after the class is over. KHIT will utilize the DAWG Pound at certain times. Hydrate, Hydrate, Hydrate. Functional Wrestling Conditioning. This class is for everyone wether you are a wrestler of never stepped on a mat in your life. You will be taken through a functional movement circuit as you alternate with wrestling conditioning moves on the mat. It’s programmed to keep your heart rate up, burn calories, and work your core all while having a blast. The mission of KOMBAT Wrestling Foundation is to provide the youth of central Florida and its surrounding areas with opportunities to develop citizenship, discipline, teamwork, and physical well-being through wrestling, fitness, and nutrition. Team Kombat was a private club started to assist bringing two brothers and school friends together wrestling in the off season. During this time our founders realized the expense of practice, coaches, proper nutrition, fitness preparation, travel, and tournament entry fees are substantial and a burden that most average households with youth can't afford. So Team Kombat created Kombat Wrestling Foundation which offers Kombat Scholarships. Simply put scholarships were created to kombat the financial issue preventing our area youth from reaching their true potential through wrestling. 100% of your donation will be used to create scholarships for youths giving them access to *Kombat Fitness' Mat time, team practice, fitness classes, nutrition, and personalized coaching. Along with all the expenses of entering tournaments- travel and accommodations, entry fees, coaches, and the TK wrestler gear package (singlet, shirt, and shorts). Scholarships will include selective entry to one clinic per year provided by area top MMA and Wrestling athletes. Focus groups for teens facing certain challenges will also be provided. Kombat Fitness is opening a brand new state of the art 3000 sq ft facility. KF is the home of MAT TIME offering open mat times 7 days a week for all wrestlers to come and practice. In addition KF will have personal training, agility and strength training, conditioning class such as BootCamp Ready (geared to help anyone achieve their top physcial condition), as well as various programs. KF is excited to open its facility to KWF allowing such programs to reach all youths including specific offerings for special needs. KF will also host several sport specific clinics instructed by top MMA and Wrestling athletes.